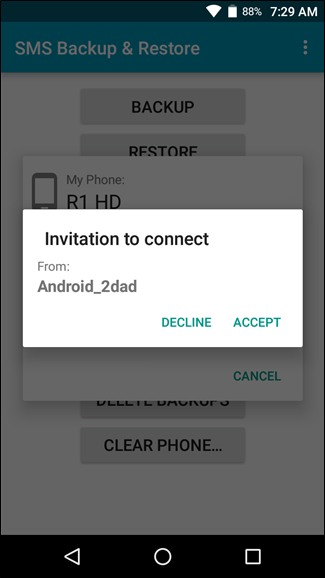 Getting a new phone is rough. You essentially lose everything you had on the old phone, which can be a little be a bit of a shock for the first several days. 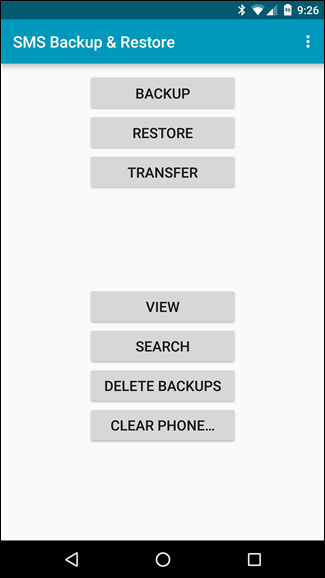 While some things—like pictures, for example—automatically come with you through your Google account, other creature comforts, like your text messages, don’t automatically sync. But it doesn’t have to be that way. 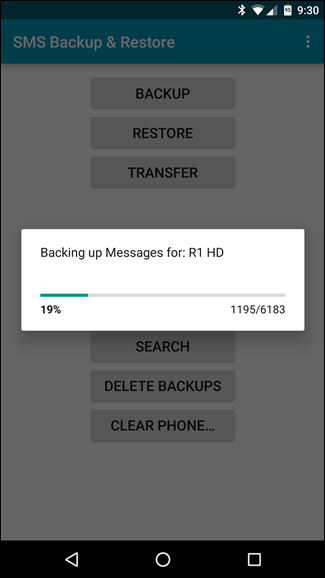 If you can’t stand the sight of an empty SMS box, you can easily move all of your current messages to a new phone in just a few steps with an app called SMS Backup & Restore. 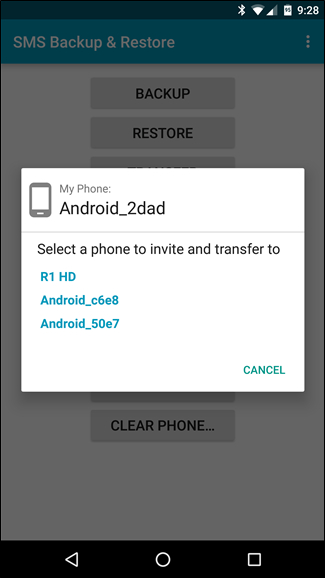 The first thing you’ll need to do is install said app on both phones, and make sure each of them are on the same Wi-Fi network. It won’t work over a cellular network! Open the app on both phones. 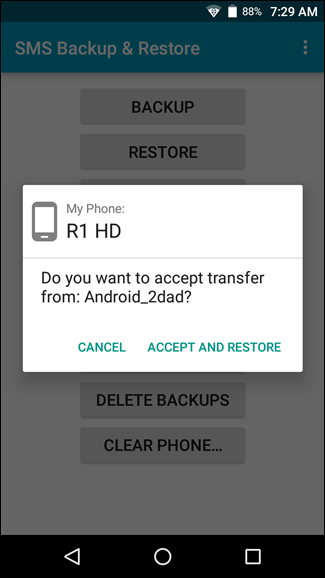 On the main screen, tap the “Transfer” button. 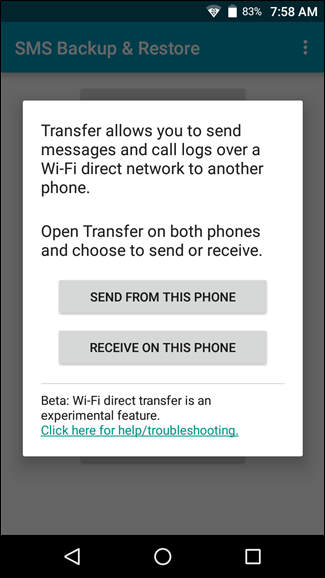 A new box will open with the details of how transferring works—in a nutshell, it sends the info over Wi-Fi. 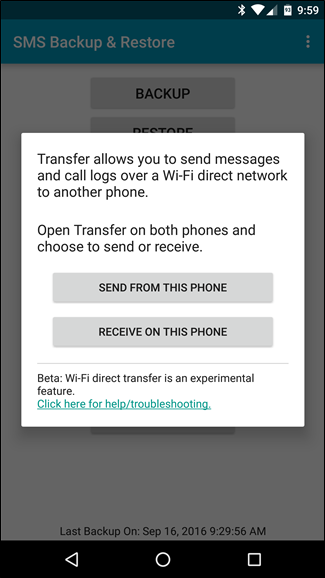 Select the appropriate option on each phone: “Send from this phone” on the old handset, “Receive on this phone” on the new one. The phones will immediately start looking for each other on the network. 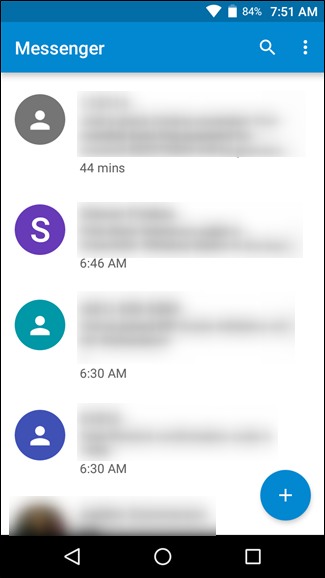 Once the sending phone sees the receiving phone, tap it in the list. This will initiate the transfer. 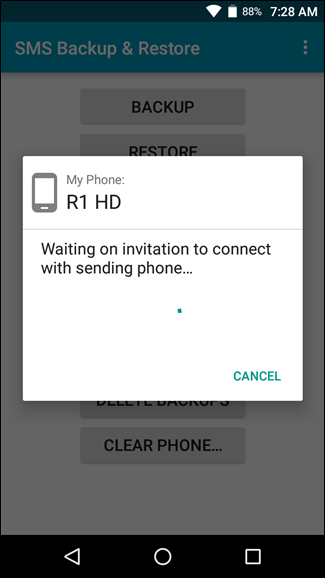 The sending phone will push an “invite” to the receiving phone. You’ll of course need to accept this invite before anything will happen. 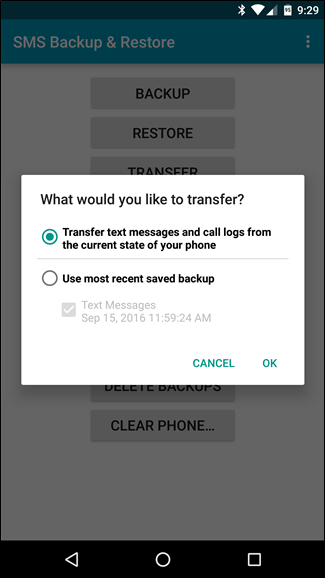 Once the phones have made a connection, the sending phone will give you a few options: “Transfer texts and call logs from the current state”, or “Use the most recent backup”. 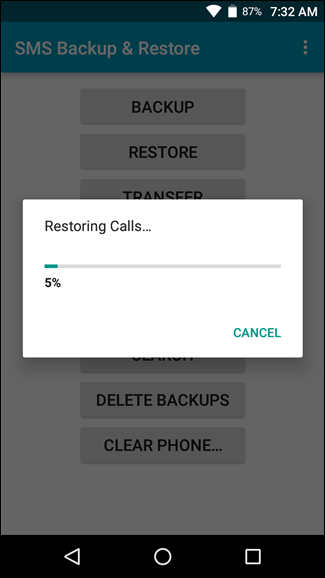 If you’ve never used SMS Backup & Restore before, then you shouldn’t have a backup available and will want to use the first option. Either way, honestly, I’d just go ahead and choose the first one. It’s the most up-to-date. 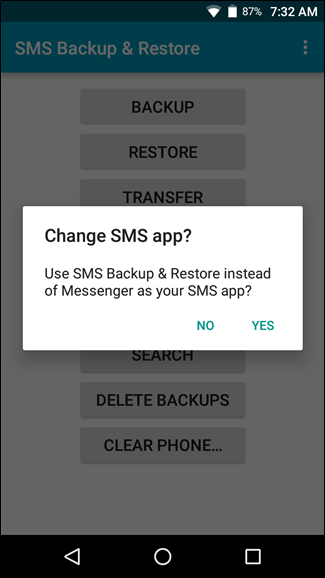 On the next screen, tap “Yes” to make SMS Backup & Restore your default SMS app. 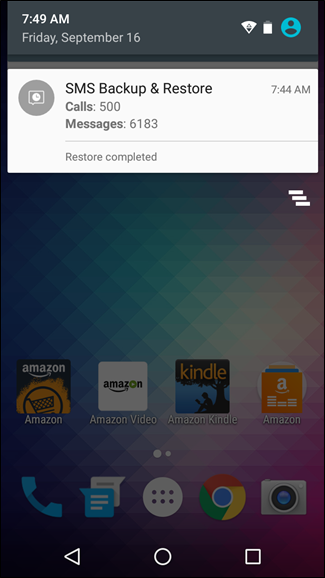 Again, you can change it back to your preferred texting app once it’s finished restoring. And now, that process begins. Kick back, get a coffee. Read a book. Watch TV. 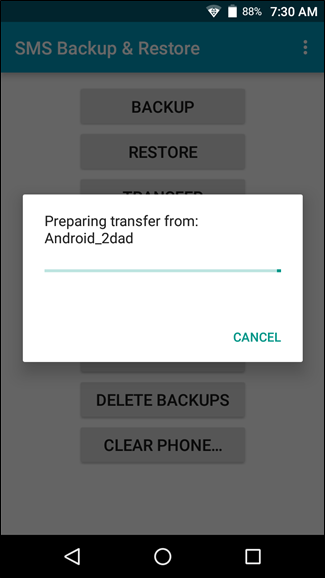 Do something that doesn’t including messing with your phone—this is going to take a while (depending on how much info it has to transfer), so just let it do its thing. Once it’s finished, you’ll get a notification stating such, along with all the details of the transfer. Look at all those messages! 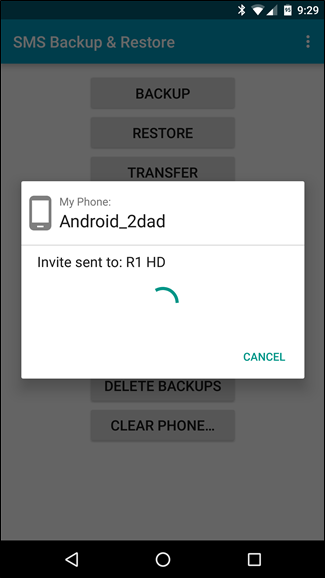 You can tap the notification if you want, but it’ll just launch the SMS Backup & Restore app with the same info, so you might as well just dismiss it. Go ahead and jump into your preferred SMS app—all of your existing texts should now show up in the new phone. 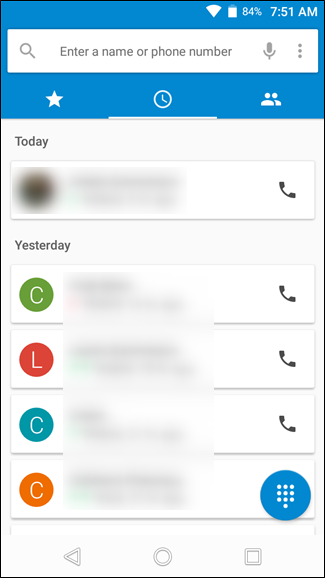 The call log should also be populated with the info from your other phone. 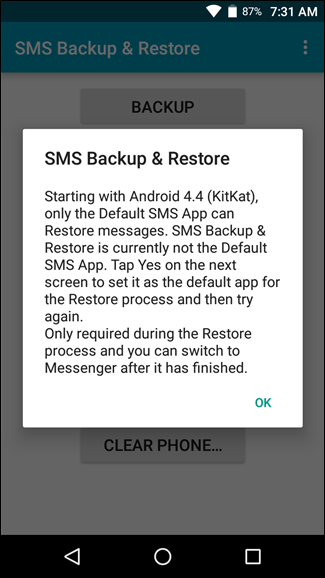 If you had to make SMS Backup & Restore the default app in the steps above, go ahead and jump into Android’s Default Apps menu and change it back to your normal messaging app. You’re done!